The Insert Pictures add-in takes multiple images of your choice and fits them into separate cells. You decide how many pictures to insert and where to insert them - in a column or row. Also, you choose what size the images should be: pictures adjusted to cells, cells resized to accommodate images, or any specific size that you set. 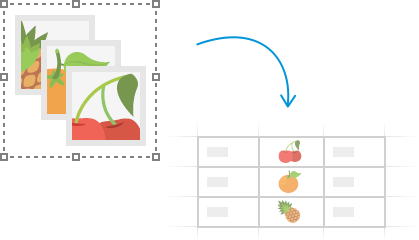 Insert sets of pictures in columns or rowsChoose to add multiple images to cells vertically or horizontally, all at a time. Fit cells to picturesHave Excel adjust each cell to the size of each image. Decide on the size of the added imagesSpecify the desired height or width so Excel pastes pictures accordingly. Fit pictures to cellsResize every image so that it fits properly within a cell. What is Insert Pictures and what do I need it for? 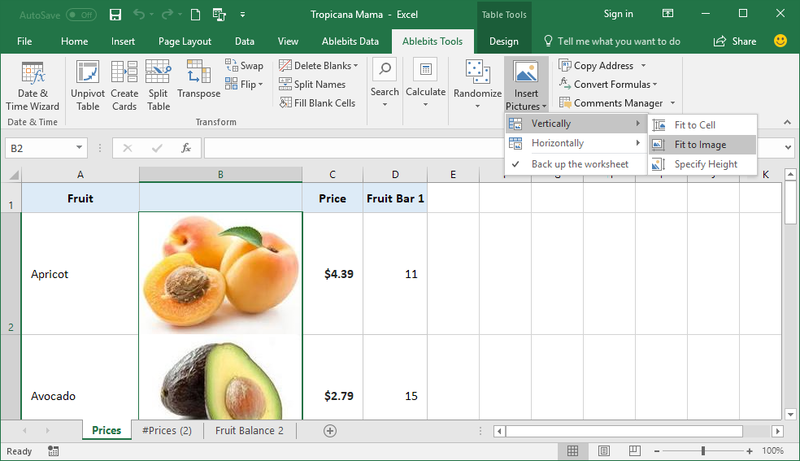 The add-in is designed to insert multiple images in Excel worksheets in one go. Choose to add a group of pictures to a row or column, and every image will be put into a separate cell. You can adjust the size of each cell to fit the size of a picture, and vice versa. Alternatively, you can specify the desired size, and both cells and images will be adapted properly. How does Insert Pictures differ from the same Excel feature? Microsoft's Pictures From File adds a pile of images to the center of your worksheet. So, you will have to drag them to the needed position and resize all images and cells manually. 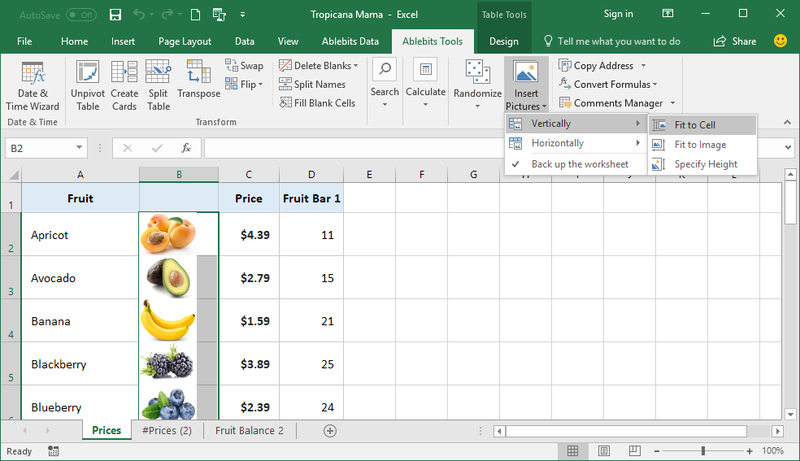 Our add-in does all of the above for you and inserts pictures into Excel cells automatically. How to insert pictures in Excel with this add-in? Choose to add images vertically or horizontally. Specify your own size and click Next. Select images from your PC. How many pictures can I insert at a time? You can add as many images as you need provided you don't exceed the limit of Excel rows or columns and workbook file size. What picture formats can I insert? You can insert pictures of the following most popular formats: .JPG, .JPEG, .PNG, .BMP, .GIF, .CGM, .DIB, .EMF, .EMZ, .EPS, .JFIF, .JPE, .PCT, .PCZ, .PICT, .RLE, .TIF, .TIFF, .WMF, .WMZ, .WPG. Are there any limits to the size of the pictures? Each picture should be at least 1 pixel wide or high. 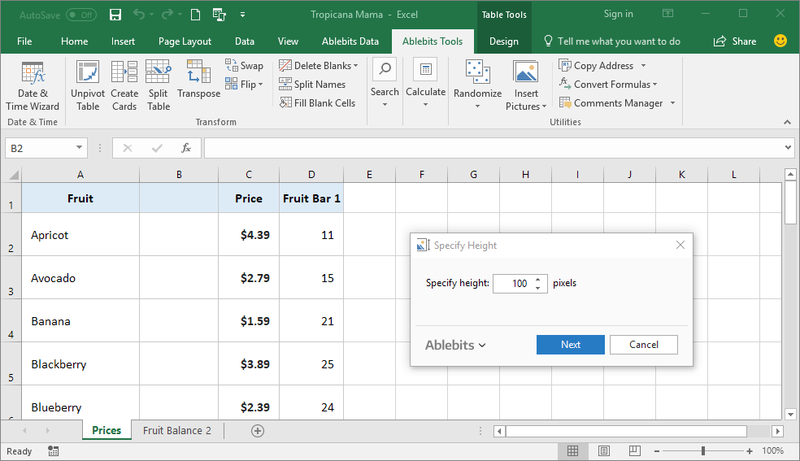 Also, to add images correctly, remember that the maximum cell height in Excel is 546 pixels, while the maximum cell width is limited to 1793 pixels. If some of your images are larger, you'll get a notification message, and they will be resized correspondingly. What happens to pictures if I copy, hide, or filter cells? Your images will be copied, hidden, or filtered as well. The picture in the copied cell will be placed the same way as the original.